The GRAMMY Museum is pleased to welcome five-time GRAMMY-Award winner Steve Lukather to the Clive Davis Theater for the latest in the Great Guitars Series. Best known as the guitarist for Toto, Lukather also remains one of the world's top session men, having played on over 1,500 records by a wide variety of artists over the years. Lukather started as a teenager in the studios after meeting the Porcaro brothers in high school. After graduation, he joined Boz Scaggs' touring band, which eventually formed officially as Toto and was singed to Sony Records in 1977. While scoring such international hits such as "Rosanna" and "Africa" with the band, he also managed to maintain his busy session schedule, playing on albums by Paul McCartney, Miles Davis, Herbie Hancock, Quincy Jones, Cheap Trick, Alice Cooper, Aretha Franklin and more. Hear Lukather in discussion, along with GRAMMY Foundation and MusiCares Vice President Scott Goldman, about his impressive career. 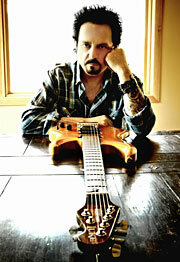 After the interview, Lukather will showcase his signature guitar work on stage.